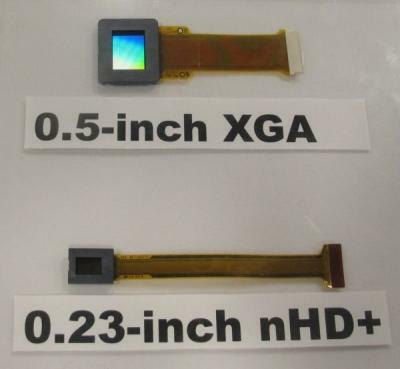 Sony announced a new 0.23" 640x400 (nHD+) OLED microdisplay aimed for wearable devices. The microdisplay features a pixel pitch of 7.8um and a 110% NTSC color gamut. Sony aims to ship this display in 2015. Sony says that the new microdisplay, while being smaller (and with a lower resolution) compared to their current 0.5" product, it offers a higher performance. The contrast ratio has been improved from 10,000:1 to 100,000:1, the brightness enhanced from 200 to 800 cd/m2 and the power consumption has been slashed from 400 to 140 mW. The viewing angle has also been improved. Sony managed to increase performance by changing the shapes and positions of the sub pixels using different RGB color filter. The red and green subpixels are square while the blue subpixel is a long rectangle. Using this arrangement, Sony managed to increase the aperture ratio (i.e. less space between subpixels). In addition, Sony changed the cavity design of the white OLED, which improved the emission intensity of blue to yellow colors. 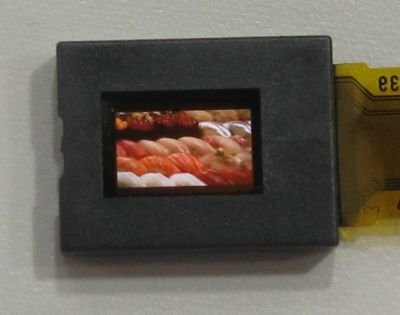 This is Sony's smallest OLED microdisplay at 0.23". Sony currently ships two OLED microdisplays: the ECX331A 0.5" XGA one adopted for camera EVFs and the 0.7" ECX332A 720p one (used in HMDs). If you want to learn more about the Microdisplay market, check out our new OLED Microdisplay Market Report. Ok but it's possible that PMOLED can get high resolution in future. Maybe. Over the past few years we've seen several companies trying to push new addressing schemes for PMOLED displays - but none were adopted commercially. Same here man, I wanna buy some too. Fujifilm and Panasonic OLED EVFs - who's the microdisplay maker?